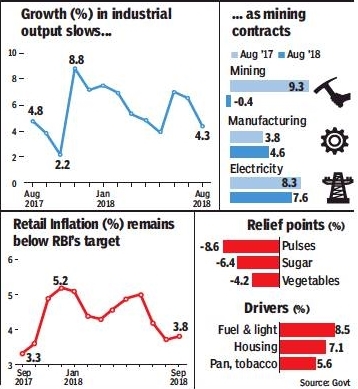 Industrial output growth slowed to a three month low in August as the mining sector contracted and manufacturing remained sluggish, while retail inflation inched up marginally in September, prompting economists to say that the RBI may hold interest rates when it reviews monetary policy in December. The index of industrial production rose an annual 4.3% in August, slower than previous month’s 6.5% and 4.8% posted in the same month last year. The capital goods sector, a barometer of industrial activity, rose 5% in August as against 7.3% in the same month last year. Retail inflation rose an annual 3.8%, marginally higher than previous month’s 3.7% growth. This is the second successive month when retail inflation has remained below the central bank’s inflation target. RBI, which was widely expected to raise rates in its October review, did not do so but pointed to the risks for the inflation outlook in months ahead.